My 1-2-3 Cents : Boo! By the way, most if not all of these photos are courtesy of the WWE. Found them on various websites, but I'm sure they all go back to the E in some way or another. 5. Jake "the Snake" Roberts: Even before Jake came to the WWE or F in 1986, he was one of the most intimidating guys in the business. He wasn't a big, bulky tough guy. Instead, he was almost snakelike, hence the name. Sneaky, cold, calculating. I remember watching him in World Class when he teamed with Chris Adams and Gino Hernandez in their war with the Von Erichs. Jake was truly a snake back then. Probably one of the best ring psychologists in the history of the game. Then he moves to the WWF and gets the whole live snake gimmick going. Beating an opponent and then putting his pet Damien on him had to be a terrifying prospect for some of those guys. Then in 1991 when he turned heel again and hoodwicked the Ultimate Warrior and crashed Randy Savage and Elizabeth's wedding with the snake elevated him to a new level of evil. Of course the infamous cobra biting incident is one that is still talked about two decades later. For these actions alone, Jake deserves a spot on this list. 4. Kane: Early Kane of course. When he first debuted in 1997, he was one of the most fierce and intimidating guys around. I hate to admit this, but I actually remember having a nightmare when Kane first started wrestling. For some reason, I was in the ring. Then all the sudden the hell fire and brimestones started. Flames shot up and Kane came down the ramp like he did every week. In the dream I was paralyzed with fear. Lucky for me, I woke up before he got to the ring. Even now, they've returned Kane to his monster roots. He's evil again. I think that's how he should be. Babyface Kane just doesn't work for me. A guy like this needs to be terrifying people, not shaking hands and kissing babies so to speak. 3. 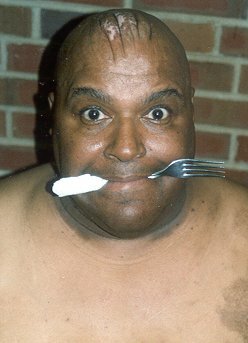 Abdullah the Butcher: Look at that face, and tell me how you couldn't be afraid of this guy. He topped the scales at well over 400 pounds and tore up anyone who got in his way. His forehead resembles a road map with all the scars carved into it. And that fork in his mouth wasn't for the post match buffet. No, Abby would use that to rip the flesh from his opponent's noggin. Most of my memories of Abdullah are from World Class. I don't believe he ever wrestled for the WWF. He had a stint in WCW when he battled the likes of Cactus Jack, Sting, and the Steiner Brothers. Who can forget that Halloween Havoc (I think it was 1991) when they put him in the electric chair in the Chamber of Horrors match and "shocked" him. I actually felt bad for the guy. 2. Bruiser Brody: Another face that only a mother could love. Brody had some epic battles with Abdullah in Puerto Rico, Japan, and World Class. Two scary guys beating the hell out of each other and not caring who got hurt in the process. 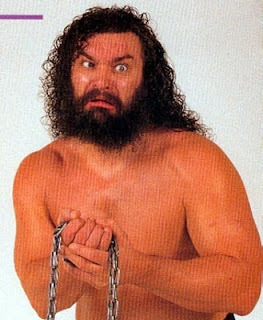 Brody was a big man, wielding a giant chain that he wasn't afraid to use against other big men like the Butcher or One Man Gang or Kamala. Brody was a face and a heel, but it never seemed to affect his persona. He was always a larger than life tough guy who beat the crap out of an opponent and did his "husk, husk" all the while. I remember watching him live at the Kiel Auditorium wrestle the world champion Ric Flair. Flair got DQed for throwing the big man over the top rope. A no-no back then in the NWA. Brody's life was cut too short. As most of you know, he was stabbed to death in the locker room at a show in Puerto Rico. He was only 42. I often wonder what would have happened had he lived. Would he have ever gone to the WWF? If he had, would Vince have strapped him with some lame gimmick and rebranding or let him be Brody. 1. 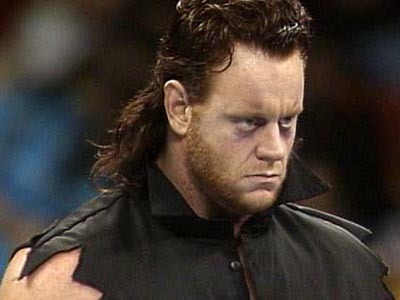 The Undertaker: It's been 20 years since the Undertaker first debuted at the 1990 Survivor Series. If you would have told me then that he'd still be around today, and one of the biggest stars in the history of the industry, I would have laughed at you. But the Undertaker gets the top spot for staying power alone. It's a gimmick that has worked for him with a few alterations along the road. The early days when he would stuff an opponent in a bodybag were intense. Remember the attack on the Ultimate Warrior and leaving him in the coffin. It wasn't long after that they turned the Undertaker face. He was still intimidating and carried his urn. He buried opponents like Kamala, Jake the Snake, and the Giant Gonzalez. Just when you thought he was starting to lose his edge, he went heel again and became satanic. That may have been his scariest phase, when he was leading the Ministry of Darkness. Who can forget the attempted black wedding with Stephanie, the weird cross, and the hanging of the Big Bossman at Wrestlemania 14. Honorable mentions: I started thinking of others as I was compiling this list and feel like they should be mentioned too. Big Van Vader and Cactus Jack/Mankind. I probably should have had Foley on this list and he was one of the best with the mind games too. And his dive off the top of the Hell in a Cell at the 1998 King of the Ring is legendary. I salute all those who have worked to create fear in the hearts of their opponents and the fans watching. Happy Halloween. Things That Make You Go, "Huh?" Freak of the Week: Isaac Yankem, D.D.S.